This is a butterfly host plant. It gets waxy alien-like lavender to white flowers, but they are quite pretty. The flowers last a long time and you can see them sometimes through out the whole year. In Thailand, they use the flowers as floral arrangements. The flowers are also used in other countries for several other things including leis. 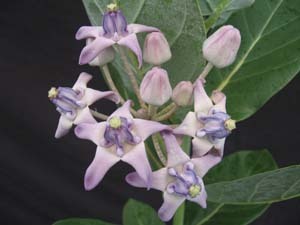 In India, the plant is known as Madar and is often seen in temples.